Maryland, small as it is has a diverse landscape – flat farm lands on the Eastern Shore and mountains in the west. Here are 7 quintessential experiences one can have when it snows. One doesn’t have to go to Alaska to see (or participate in) dogsledding. Husky Power Dogsledding, the southern-most dogsledding business in America, offers visitors a chance to see and experience mushers in action. 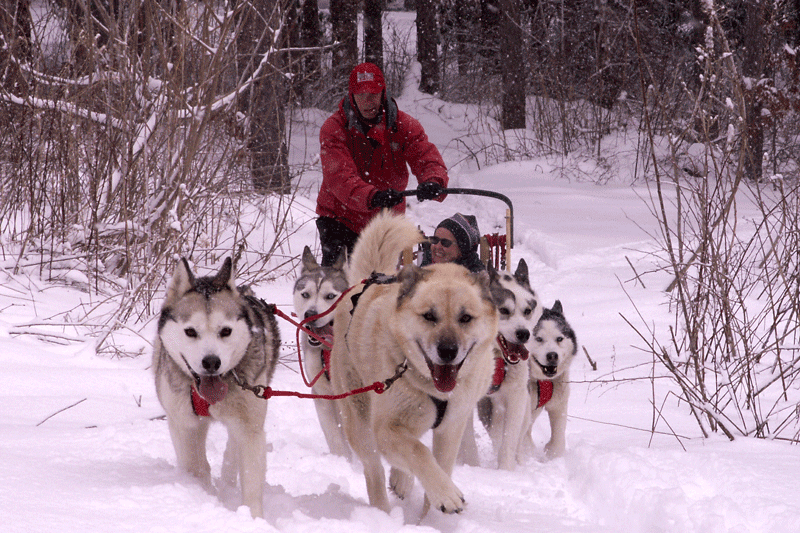 The entire dogsledding experience includes learning about the equipment and processes of dogsledding, getting to see how this Siberian Husky team lives, trains and plays – and enjoying an exciting ride through wooded and open trails in scenic Mountain Maryland. Even when it isn’t snowing it’s worth a visit. If there’s no snow on the ground, there are wheels that snap onto the dogsleds to accommodate dry weather. This is once-in-a-lifetime fun. Mike and Linda Herdering train, wrestle with and care for their amazing team of huskies in the gorgeous mountains of Western Maryland. Their business is tourism focused and they welcome visitors. 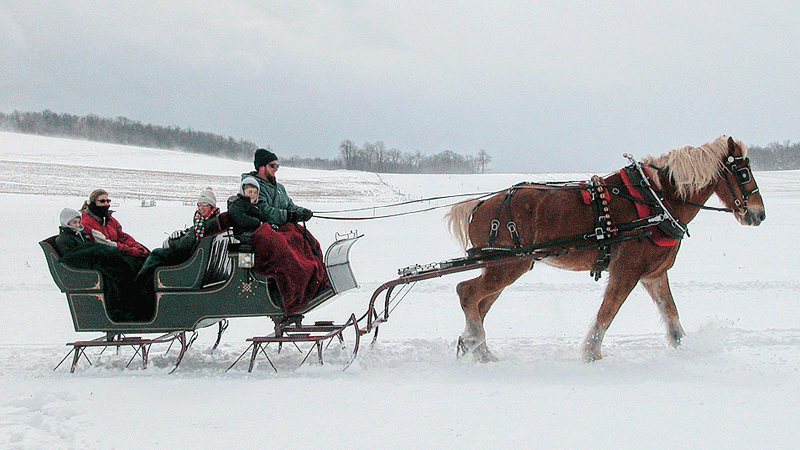 Who doesn’t dream of dashing through the snow in a one horse open sleigh? Pleasant Valley Dream Rides in Oakland (Garrett County) offers just that. Five to seven people can pile into horse-drawn sleigh, snuggle under a blanket, and be pulled through the Pleasant Valley fields while taking in the agricultural landscape of Mountain Maryland. Who wouldn’t want to do this? Sleigh rides are offered Mon-Saturday until 10 pm, so a ride in the moonlight is an option. No snow? No worries. The sleigh can be outfitted with wheels and offer a similar ride minus the snow. Rides last about 45 minutes. Reservations are required. Farm Store – The Miller family (owners) also have a Farm Store on the property that is open to the public. Every knows about skiing. And snowboarding and snow tubing are popular cold weather sports. But what about a Snow Roller Coaster? 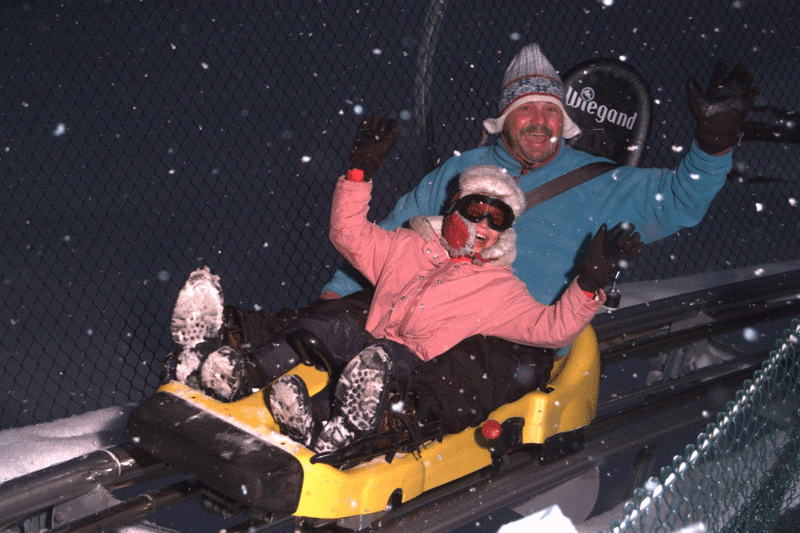 Instead of sitting in a chain of cars looping around in an amusement park, The Wisp Mountain Coaster puts you in a bobsled car and allows you to follow a track set in the snow covered Allegheny mountains. A cross between an Alpine slide and a roller coaster, the driver of a 2-seater sled-like car can regulate his or her own speed with the use of hand brakes. The coaster cars weave in and out of forest, and twist and turn as they climb over 350 vertical feet on the eastern side of Wisp Mountain. For visitor who wants to combine a package that includes snow tubing, ice-skating and the Mountain Coaster, the Bear Claw Adventure Combo is available. Of course, the Mountain Roller Coaster is a part of the WISP ski resort – the only full-service ski resort in Maryland. Romantic Getaway – they’ve got Yurts! 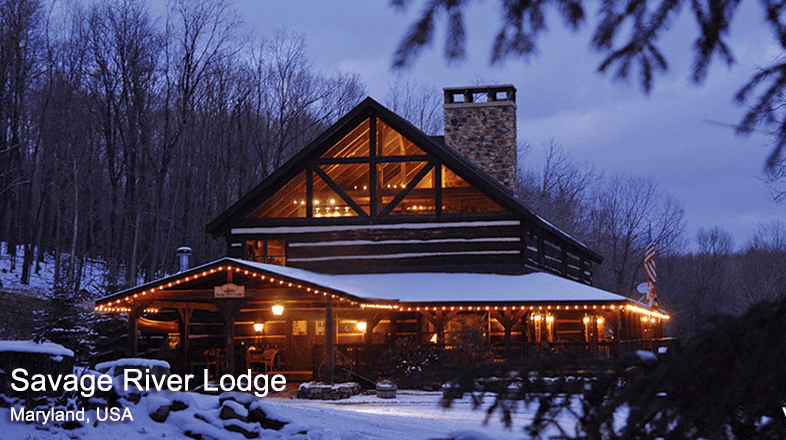 If you’ve ever dreamed about being with love in a secluded, romantic, luxurious place set in a stunning natural environment where every amenity you could want was just a short walk away – Savage River Lodge, in Frostburg is for you. Imagine sharing a private, two-story cabin complete with gas-log fireplace, warmly furnished sitting area, refrigerator, hot beverage and wine supplies, a full bath with soaking tub and thick towels with your special someone. Then imagine when waking up and opening the cabin door to find a basket of fresh juice, muffins and a newspaper on the door step. Stepping out of the cabin, guests find themselves surrounded by 700 acres of the Savage River Forest. A short distance away is the Lodge, a sort of central meeting area with a restaurant, bar, and gathering areas where guests can read, play board games, chat or get information from Lodge staff about navigating trails through the forest nearby things to do. Hosts Mike and Jan Dreisbach provide a warm, hospitable experience in an upscale setting. And …. they are pet friendly! Yurts! In April, they’ll have yurts available. Yurts originated with nomads of Mongolia, Siberia and Turkey. They were circular, collapsible tents made from skins that provided a home-like shelter. They’ve been reinvented and recreated all over the world and now are marketed as unique travel accommodations. The Dreisbachs are adding 8 luxury Yurts to the Lodge complex. They will have private baths, king size beds, sitting areas as private deck and yes….. yurt guests will also get the juice and muffins basket. Who says hunting sea glass is just for the summertime when you’re at the beach anyway? Sea glass hunting in the winter has its advantages, one being there’s little competition. Few people venture out to the beach in cold weather. Another advantage is that snow reflects the light and sea glass sparkles. It’s easier to see in bright light. Third advantage is that stormy weather (such as a snow storm) stirs up the sea and pushes more gravel, shells and – yes sea glass to the shore. After a snow storm is a great time to start a sea glass collection. 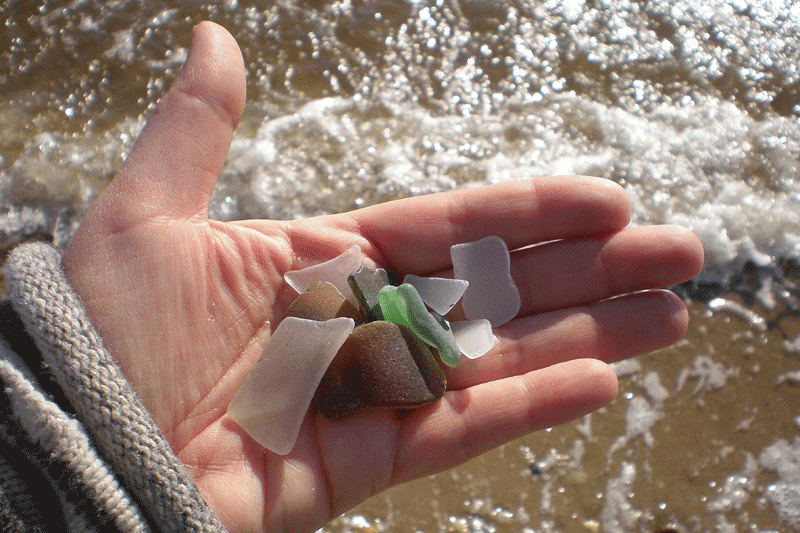 HINTS FOR FINDING SEA GLASS – Check the tides an aim for the first low tide of the day. Check the wrack lines or the lines of debris left by the last high tide. Watch for reflective surfaces in pebble and shell mounds or clumps of gravel. Check shorelines that are close to areas where creeks and streams enter the waterway. These were popular areas for trash dumps years ago. Waterways near commercial areas are best. GOOD SEA GLASS BEACHES – Tolchester Beach in Kent County (sits across the bay from Baltimore), Matapeake Beach in Stevensville in Queen Anne’s County (once of Ferry landing), Roaring Point Beach on the Nanticoke River, Deal Island Beach in Somerset County, any of the back bay beaches along Chincoteague Bay between Snow Hill and Chincoteague.. Then there’s always the good ol’ Atlantic Ocean. My preference is Assateague Island. All of these locations are marked on my Sea Glass Hunting Google Map. Take a winter stroll through the Nature Trails on Assateague Island National Seashore. Wander down the Life of the forest nature trail. There’s nothing quite like the marsh landscape in the snow. 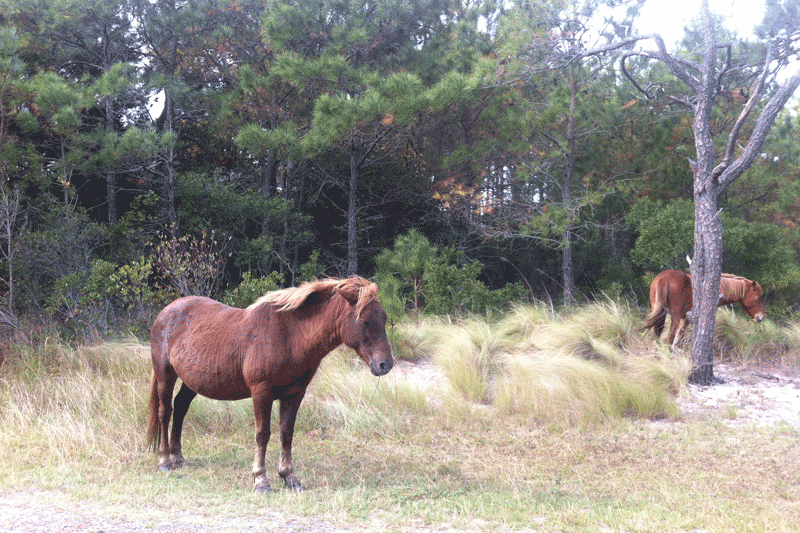 The ponies on the Maryland side of Assateague Island run wild all year so you will probably catch a glimpse of them in the forested sheltered areas during a snowstorm. Seeing an Atlantic beach in the snow is an amazing site, and while the wind may bite, it’s no more cold than a skiing down a mountainside. Dress warm for this one. You won’t be sorry. Probably no other Maryland cultural food is as associated with winter as Oysters. Pronounced “aush-ters” if you’re a local. That winter link stems from the old saying “Only eat oysters during a month that has the letter R in its name” excluding May, June, July and August. This is no longer applies now that refrigeration options are plentiful, but the oyster still has it’s legacy as a winter-time comfort food in Maryland. 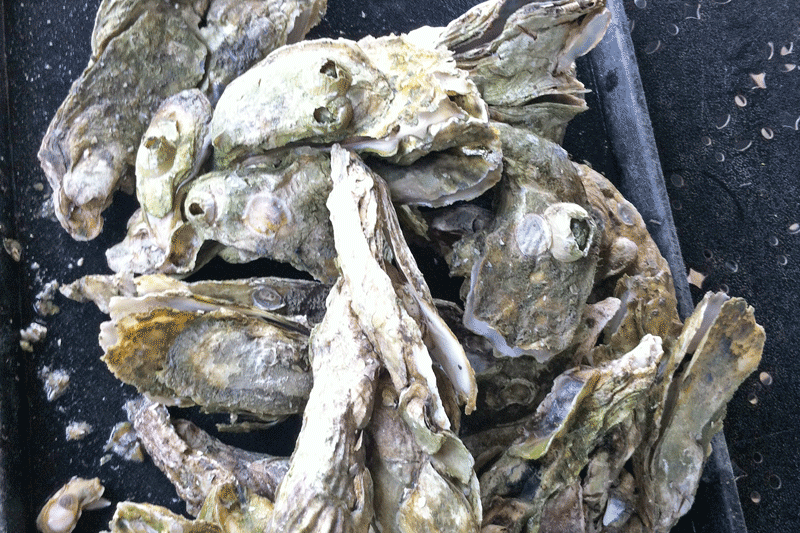 If you don’t like them raw, have them fried, or baked or made into a fritter (yum) or have oyster stew. The lower shore has an oyster chowder which is more like oysters in chicken stock. Delicious! HINT – Try to find Chincoteague oysters. Oysters that come from the Coastal bays of the Eastern Shore have a naturally salty flavor from being in close proximity to the ocean. The flavor is to die for. Many restaurants will advertise “Chincoteague Oysters” because they are in high demand. Unlike most of my women friends, the older I get the more I hate the heat. I love winter. I love the snow and I love to be outside when that crisp whiteness paints the landscape. Don’t let the cold stop you. You don’t see the skiers, the snow-boarders, the winter hikers in snow shoes wincing at the cold. They’re dressed for it. Remember that old Norwegian Proverb. There is no such thing as bad weather. .. just inappropriate clothing. We’ve just had a storm. Go out and do something unusual and fun these next few days.